We were strolling down a crunchy gravel road in central Oregon as my adventurous cousin, who I knew only in the context of Christmas letters and the occasional family reunion, gave me advice about life. “I met Ben this spring, and I think he is different than anyone before.” She shared the details of her new romance, I listened in rapture. Ally didn’t know it yet, but I was determined to be just like her. I had read every word she blogged about backpacking through South America and I had eavesdropped on phones calls between my mother and hers, discussing Allly’s apartment in downtown Portland and her eclectic collection of jobs and boyfriends. I was sure no life could be more romantic and strong, independent and adventurous. My hand absentmindedly traced the grains of wood along the fence, lining the road. I asked Ally endless questions about how she chose her countries to hike through, when was the appropriate time to kiss a boy, how do you know what love is. And lastly, was she afraid to begin her 50 state road trip the next day? I can’t remember all of her answers, but I do remember her resolve. She spoke methodically, the way one who has been telling their story over and over might do. How she quit her job, sold her stuff, and was ready. Maybe she was afraid then, her book makes it clear that she was, but all I could see was courage. Ally left the next day with Sharaya, and I ate up every word they served on the Packing Light blog. I annoyed anyone within ten feet of my computer about details of their adventures. I laughed with them, and prayed when I received the text about their car breaking down. They didn’t realize I was with them, but I was. And when Ally finally got a book deal, to write about all of those silly adventures and dinner parties, I couldn’t wait to re-read the words of wine tasting in Maine, and camping in Wyoming. I sat in a coffee shop in downtown Minneapolis, holding the first draft of “Packing Light” three years after my walk with Ally in Oregon. Romance and strength, independence and adventure. What’s funny is I did find those things, but I have realized it wasn’t a matter of becoming someone else, but discovering who I already am. This is where Ally begins her adventure with the book, and I expected the rest to read like a travel tale. But it is so much more than that, Packing Light is about discovering who we are, and what we are willing to give up in order to really be the best version of ourselves. Packing Light is about examining our baggage, and learning how to choose what to take us. About learning that in order to grow up, we do in fact have to choose. Holding onto everything does us no good. Ally has managed to weave humor, suspense, inspiration, and refection into 258 pages. The influence of her writing has spread like ripples into every aspect of my own life. The answer Ally, is yes. 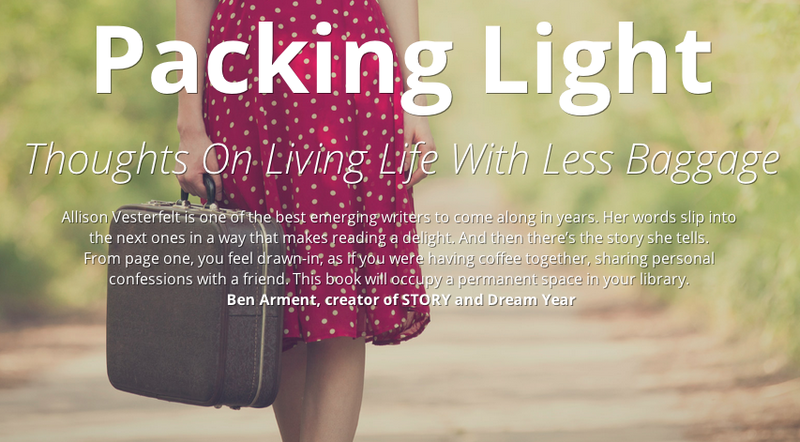 Check Out Allison Vesterfelt’s blog, or purchase her book Packing Light here. Thanks for sharing Krisi! I’m enjoying reading Traveling Light! I’m hoping I can pull off Ally’s wonderful insights and perdpectove as I pack for 2 weeks in England…….. I Always overpack!!! Then when I get home I really want to downsize and get rid of 40 years of stuff that keeps me from living the life I want! Also looking forward to sharing this book with my 32 year old daughter as she goes through a life transition.